Seven point four billion. That’s the current estimate for our world’s population. Yet even with those odds, here we are thrown together by chance and by choices made – some by us, some by other people. We are reading this same email, hearing the same messages, enjoying the same entertainment, each of us having the opportunity to learn and share and grow in ways that can not only impact ourselves personally but create a ripple effect to benefit those whose lives we touch, impact, influence. I believe the people who take a moment out of their busy take to pause and read the Your Life, Unlimited message are a unique & special group. A group that knows that we must be continually immersed in the world of personal development. We know that ‘one hit’ only lasts so long. We know that we must surround ourselves with people who build us up, who inspire us, who ‘get’ the fact that we can and do make positive change possible. There is an Invisible thread that connects us – all seven billion of us and the thousands of us that are reading these words. No matter our differences, our gifts, our talents or our shortcomings, we all want to be happier, healthier and to have stellar relationships in our lives. None of us, none of us, can do this alone. We need to tug on that invisible thread and pull someone else closer so that we can work together for the betterment of us all. I urge you, do not be passive. Be proactive. Seek out the invisible threads that are present every day, every where you go, in everything you do. Our community – local and global is here for you – it’s like a buffet – everything is laid out for you to enjoy. It’s just that we don’t feed you, we don’t tell you what you should choose – look at the selection, notice what you are drawn to, choose it with purpose and intention. 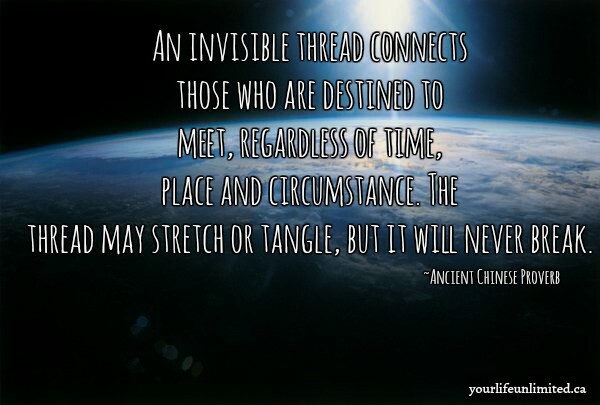 That is your invisible thread. Use it. Seven point four billion. It’s no accident that you are here. Be here 100%, find your thread, pull it and take action. Thanks for being a part of my world! Diana Beresford-Kroeger, author of The Sweetness of a Simple Life and the international bestseller The Global Forest, gives us some beautiful insight into using nature to sooth our souls. Lisa Lounsbury, Corporate Wellness Expert, shared some tips and inspiration for making the elusive fitness goals a reality. Hint – it starts in your shopping cart! This entry was posted in Blog, Communication, Empowerment, Happiness, Motivation, Personal Growth, Positivity and tagged communication, Motivation, personal growth, positvitiy, success principles. Bookmark the permalink.